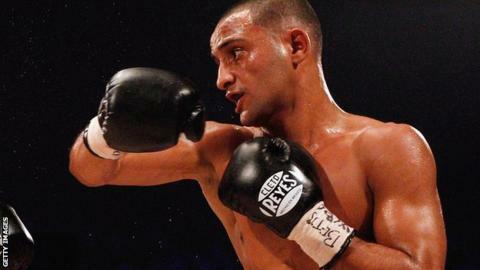 Kid Galahad dominated his IBF youth world featherweight championship contest to beat Brazilian Adeilson Dos Santos on points in Sheffield. Galahad showed his superiority from the opening round of the contest in front of his home crowd. The 24-year-old floored Dos Santos with a strong right hand in the closing seconds of the first round. Dos Santos, 22, was down again in the 10th from a right-hand jab before the judges awarded a unanimous decision. The 12-round contest at Ponds Forge was scored 119-107, 117-109 and 120-105 in favour of Galahad. "He was dangerous, so I had to show my dominance from the start," he said. "He was hard to hit and by far the toughest kid I have boxed so far." Before the fight, recently-crowned IBF world welterweight champion and fellow Sheffield boxer Kell Brook was introduced to the crowd. Brook is recovering from serious leg injuries after he was stabbed while on holiday in Tenerife.